Many years ago, the desktop or personal computer market was split between Apple and IBM. Apple had always relied on its own operating system, but IBM licensed the Microsoft operating system or DOS. You might note that IBM no longer manufactures personal devices of any kind, but Microsoft continued to dominate the personal computer operating system market. Well, fast forward to today. Where are we with operating systems? Initially, very few genealogy software programs were developed for the Apple operating systems and most of the programs were available only on Microsoft based computers. The arose a common belief among genealogists that good genealogy software was available only for Microsoft based machines. It is time to re-evaluate and discard that out-dated notion. The main reasons for this need to reevaluate is that the dichotomy between Apple and Microsoft is crumbling. The new kid on the block, Google, is making serious inroads in both the software and hardware areas of personal computing. 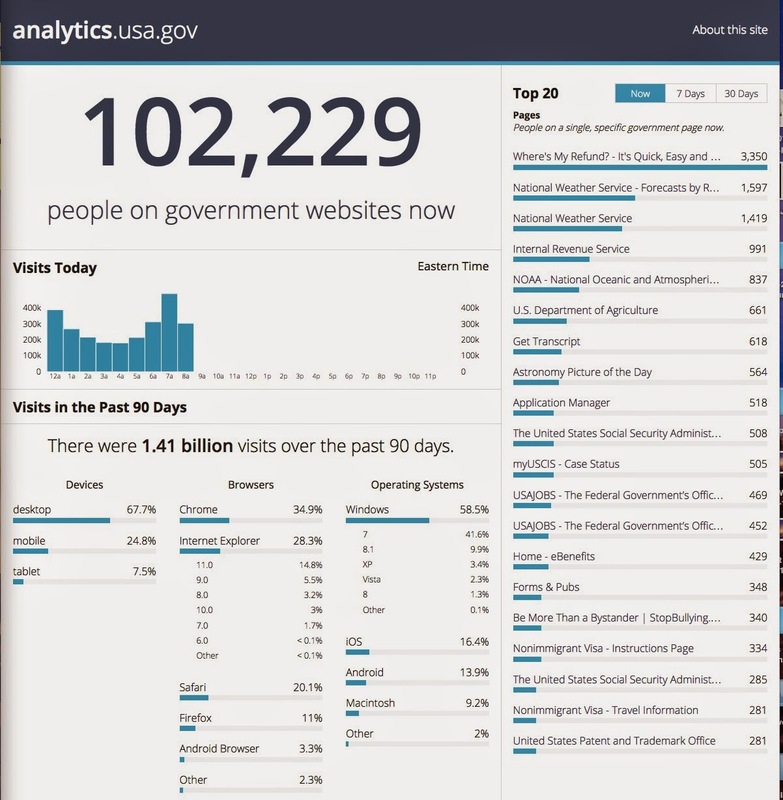 One way to tell what is happening is to look at websites such as analytics.usa.gov. 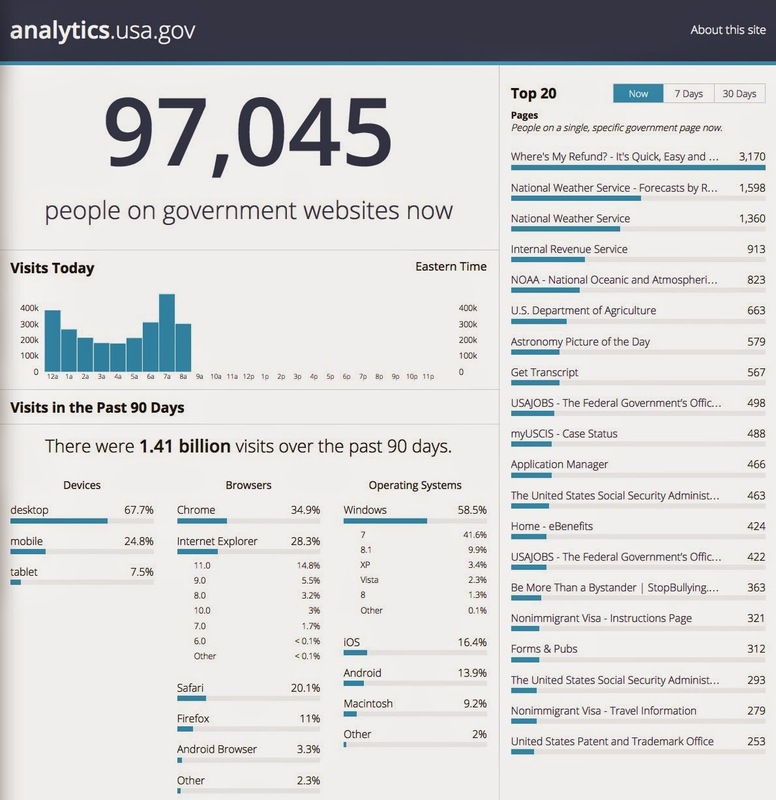 Here is a screenshot of the current state of computer use by nearly 100,000 people on U.S. Government websites. This website monitors usage in real time. Look at the browser usage. Google's Chrome is easily the most popular browser, with Internet Explorer and Safari right behind. Note that Internet Explorer (Microsoft) is fragmented into usage versions roughly corresponding to the usage of operating systems. More than half of the Windows operating system users are at least one full version back in their conversion to Windows 8. But note who is second; Apple with its iOS operating system. Mobile devices account for slightly more than 30% of the usage with the systems pretty evenly split between Apple's iOS and Google's Android. Here's what was happening as I was writing this post. As the number of users rose, the percentages held pretty steady. There are some definite conclusions here. 1. The market is no longer a two-way battle between Apple and Microsoft. It is clear that Google is becoming a dominant participant. 2. The use of mobile devices is eroding the dominance of desktop computer. 3. Microsoft's fragmented market is an indication of the difficulty Microsoft is having in maintaining a dominant position. Even if Internet Explorer comes pre-installed on new PCs, people are shifting to Google's Chrome. Note that only 3% of the users have upgraded to Internet Explorer 10.0. 4. The use of mobile devices coupled with the usage of Windows 8 and 8.1 indicates that very few mobile device users depend on Microsoft's operating systems. This is supported by current sales figures of falling sales for desktop and notebook computers. See "Gartner Says Worldwide Traditional PC, Tablet, Ultramobile and Mobile Phone Shipments to Grow 4.2 Percent in 2014." In the genealogy software area, there is a decided movement to using online programs. None of the genealogy software developers release sales figures, but my impression is that unless a desktop-based genealogy program is combined with the ability to access one or more of the major online database programs, sales will be marginal at best. In addition, during the past two years, there have been a number of better selling genealogy programs that have released Apple OS X version or compatible versions of their software. In addition, if the genealogy software programs do not move decisively into the mobile market with full featured apps, they will begin to lose even more market share. 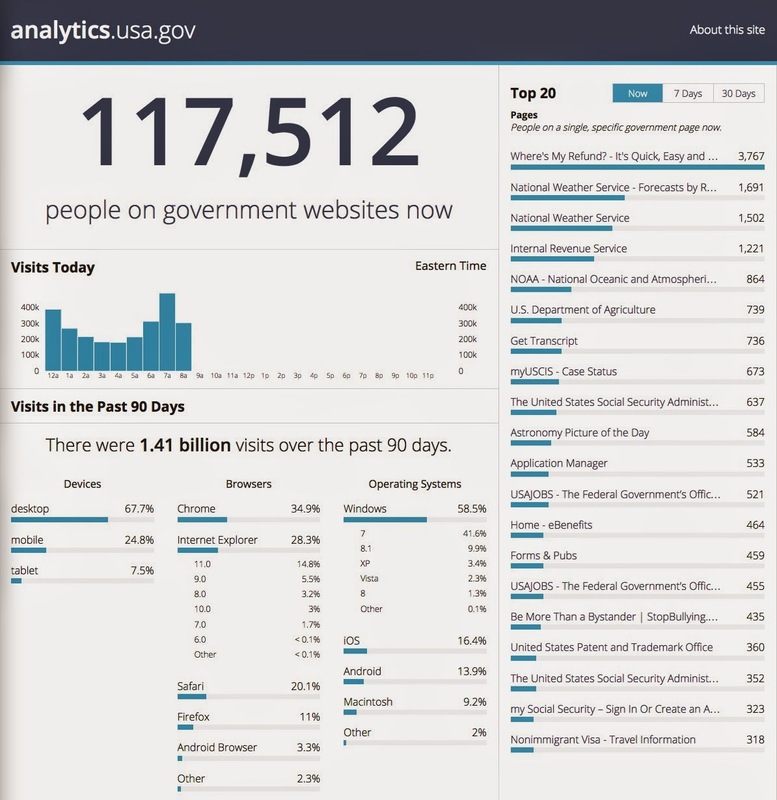 Here is another update of the analytics.usa.gov website. Here are the sales figures for operating systems from Gartner with projections for 2015. You can make your own conclusions, but it looks like to me that any program that fails to make a mobile application and an Apple iOs or OS X version is going to ultimately fail. I just inherited a huge pile of genealogy. Now what? From time to time, as has happened recently, I hear from people who have just "inherited" a huge pile of genealogically related records, documents, photos etc. This usually occurs upon the death or disability of a relative who has spent a considerable period of time amassing this collection of information. In some cases, this occurrence results in the loss of all of the information when it is summarily thrown out and destroyed. But in some rare cases, the recipients are mindful of the value of the information and it is preserved in some form or another. Sometimes the cache of records is maintained in a basement, garage or other storage area until some interested relative comes along and retrieves the records. This has happened to me personally a number of times. I have "saved" quite a number of collections over the years. The question is, what do you do with this pile of stuff? The answer to this question depends on a lot of factors, most importantly, the interest and ability of the recipient. Most, if not nearly all, of the recipients of such information have not volunteered to receive the pile of records. Many such recipients have neither the time, the ability, nor the inclination to "carry on" the work of the genealogist. There are, unfortunately, very few record repositories that are willing to accept random genealogical papers. The rare exceptions are collections that usually involve prominent historical figures in the geographic areas covered by the repositories' interests. One interesting effort to preserve these collections is The Genealogical Library Center, Inc. run by Arlene Eakle and her husband in Tremonton, Utah. This is an excellent example of how one or two people can make a difference in preserving these valuable documents. If the collection is unique or has real historical value, there may also be a museum, historical society, state or local library, university special collections library or other institution that is interested in the collection. The main issue, as described by Arlene, is that the heirs or other family members do not appreciate the value of what the genealogist has accumulated over the years. It is imperative that anyone interested in genealogy be aware of the possibility of the loss of the collections of fellow genealogists and offer to rescue the information if possible. From my own experience, I would suggest that steps be taken to preserve the information. Of course, the best thing that can happen is that the genealogist will make adequate provisions for sharing and preserving their own research. This often does not happen because of the solitary nature of genealogical research and the type of person attracted to the pursuit. In order to find someone involved and interested, you may have to search well beyond the confines of your immediate family. First, the nature and extent of the research needs to be evaluated. If the person receiving the collection does not have the background to evaluate the records, then they need to seek help from someone who does. This can be a family member or someone from the greater genealogical community. Ideally, you will find someone who wants to acquire the entire collection. But what if you are the interested person? How do you handle a large amount of information? What if you determine that the entire collection is nothing more or less than a pile of photocopies and extracted records? Perhaps, the best way to approach this situation is to see how much of what is present is already online in the FamilySearch.org Family Tree or some other large online unified family tree program. One of the collections of records I acquired was nothing more than copies of other, reasonably available records, mostly photocopied family group records. The first level of examination is to determine what, if anything in the collection, is unique and irreplaceable? As I already mentioned, this may include consulting with people who have more expertise in this area. The value of genealogical data is directly proportional to the degree to which the collection contains original documents, letters, diaries, journals, photographs etc. Any original documents should be preserved even if digital copies of the documents have been made. The value of original documents cannot be underestimated. Steps should be taken to preserve these valuable original documents or artifacts. For information on this process of preservation see Preserving Your Family Treasures from the Library of Congress. There is no substitute for sitting down and looking at each and every document and record in the collection. Without direct examination of the records, assuming that some pile of records is unimportant is extremely dangerous and detrimental to the process of preservation. I am always amazed at what some people with throw away as unusable or of no interest. Where you set the threshold of what to keep and what to throw away is a highly personal decision. The best possible outcome of any collection is that it is preserved and made available to the family in the future. One way to do this is to digitize any and all of the records and then organize the digital copies online. The best place to do this, in my opinion, is on FamilySearch.org. Presently, the Family Tree program and the Memories program on this website can accommodate huge amounts of family information. Because of the nature of the organization, FamilySearch has in the past and will in the future make every possible effort to preserve the information included in the website. What if the "collection" is primarily a computer file, either a GEDCOM file or in some other program? This presents a restoration problem, but makes the transition to another more current program possible in some cases. The value of the information contained in the program is, again, directly proportional to the amount of documentation and a record of the sources where the information was obtained. If the same information can be found online, it may only be necessary to compare what is already in the file to what is readily available about the family online. Do not ignore the issue of preserving and conserving the collection. Take action to ensure that the valuable information is preserved for family members. What is the probability of finding your ancestors? This is an interesting question: what is the possibility that you will or will not find your ancestors? Each time I look at a weather forecast, I wonder what they mean when they say there is a certain percentage chance of rain. The reason I wonder is because I think there is a very loose definition of "rain" where prediction is concerned. If it rains one drop, does that constitute a validation of the prediction? It seems to me that rain, even on drop, is an either/or proposition. If it rains one drop, then the chance of rain went from zero to 100%. If it does not rain, the chance of rain stays at zero. Weather prediction has not advanced to the point where anyone can foretell the falling of that one drop of rain. Now general percentages of the probability of rain seems to work fine for places like Mesa, Arizona and Provo, Utah that have relatively little rain, but what about a place like Panama City, Panama, where it rains three times a day in the wet season and only once or twice a day in the dry season. What about some places in Hawaii where it rains over 400 inches a year? Even in Colon, Panama on the north coast, the rainfall is over 130 inches a year. When something, like rain, is an almost constant, what is the use of predicting a probability of rain? Isn't the probability of at least a drop of rain almost 100% every day? So what do we mean when we talk about probability? If we define probability as the extent to which an event is likely to occur, measured by the ratio of the favorable cases to the whole number of cases possible, then what is the probability that I will find an ancestor? Any ancestor or a specific ancestor? This question revolves around the definition and application of the term "favorable cases." If you are trying to predict the percentage probability of rain or no rain, you look to forecasts based on present conditions plus historical records. When such and such happens, we know we had rain in the past so many times and so we can predict the possibility of rain in the future because we are historically right a certain percentage of the time. The more information about the existing conditions you can gather and the more historical events you can review, both increase your accuracy. This is the reason why computers have had such an impact on weather prediction. They can analyze so much information so quickly. If you think about genealogy in the abstract, you would probably come to the conclusion that the more ancestors you had already found and the more you know about the existing historical records, the higher the probability that you would find more ancestors. You could bolster that conclusion with the argument that the number of ancestors (just considering direct line ancestors) doubles with each generation. So the probability of finding your own parents (two people) would be rather low, but as you add members of your ancestral family, the chances of finding one more ancestor improve in direct ratio to the number already found (i.e. the favorable cases). Just as with weather forecasting, you must also include information about the existing records and what they might contain. What about the probability of finding one specific ancestor? Here the issue is that the number of "favorable cases" has no bearing on the discovery of a specific ancestor. Therefore the chances of finding a specific ancestor would seem to be rather low and may approach zero in some cases. This is analogous to trying to predict the fall of one rain drop. With physical phenomena, such as rain or snow etc., we assume patterns and cycles as measured by keeping a record of past events. We have no such ability in genealogy. Just because I find a family member in Denmark says nothing at all about my ability to find another family member in England or Germany. This is true based upon an assumption that an individual researcher likely knows the records of one particular place more thoroughly than some other place. So the favorable case scenario has no predictive force in genealogy. You could argue that your ability to find ancestors, any ancestors, increases with your experience. However, that would mean that I could never predict the probability of finding an ancestor, even any ancestor, without knowing the exact qualifications of the genealogist. Therefore, in any case I could postulate, my ability to predict the outcome of a genealogical search would be about zero. What if I factored in a score for my objective evaluation of the ability of the genealogical researcher? What if this score were based on some sort of objective evaluation, such as, the past record of this researcher in finding ancestors. But I would still guess that the ability of the researcher would have little or no effect on the probability of finding a specific ancestor, although it likely has a bearing of the researcher's ability to find any ancestor. How did I come to these conclusions? I am not a statistician, nor am I an accomplished mathematician, but I have studied a great deal of strategy. One of areas in my university studies where I had the most class hours was in military history, hence my interest in strategy. Genealogical research has a lot in common with a zero-sum game or the minimax theorem. My strategy in genealogical research is to minimize my losses, i.e. 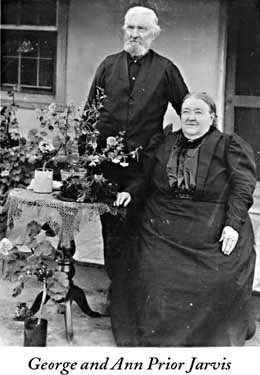 the time I spend looking for ancestors without finding any, while at the same time maximizing my gains, that is, the time I spend finding additional ancestors. I always assume the probability of finding any additional ancestor to be 100%. I also evaluate the possibility of finding a specific ancestor as being very low, with the exact probability dependent on the genealogical time/record decay curve. This is a steady sloped curve starting at 100% and ending close to zero over a 550 year time span starting with the present and ending sometime in the 1500s. Based upon this type of evaluation, I spend my time focused on those family lines that have the greatest number of records available and also, according to my evaluation, the greatest probability that I will find more related ancestors. The main difference between genealogy and military strategy (there are many differences) is that, in a sense, I do not have an opponent. But from my perspective, I do have an opponent; the mass of historical data I must become acquainted with and sift through. My opponent is also time. As I get older, my ability to spend the time necessary decreases with the loss of physical abilities. So I am fighting a game against time and records. This is one reason for my immersion in technology. I see technology as a way to level the playing field. I can use computers and my ability to search for records to leverage more time out of the system. It is inevitable. I will find more ancestors. Will I solve all of the issues left and questions that need answers? No. The probability of me answering all of the questions given my finite lifespan is close to zero, if not zero. Because I have doing research for such a long time, I have thousands of ancestral lines to choose from. So the probability of adding at least one more name, previously unknown, is virtually 100%. In addition, I can redefine my goals. This means that rather than concentrate solely on my direct line ancestors, I can work on what would be called collateral lines and their descendants. If the idea is to increase the number of documented relationships, then any unknown relative, no matter how related, becomes an objective. How long will that take? I would guess that I can add one more name in a relatively short time of doing research depending on my choice of ancestral lines. But presently, I have a more fundamental challenge. Much of the information I presently have in my possession is not organized and is the result of collecting information for over 30 years. I can make a choice. I can try to extend existing lines or I can try to document and cite the information already in my family tree. In other words, have I extended my supply lines to the point where I may lose the entire battle? Do I need to consolidate? I have chosen to document my tree rather than spend time adding more names in the most recent past. But I am now in a position to begin to move both back in time and sideways in time and add additional families. As I continue my documentation, I will find additional family members. That again has a 100% probability. What are the factors that determine an increased probability of finding ancestors and other relatives? First of all, you must be able to move past the initial state of finding relatives. If you are an orphan or foundling and do not know your parents, your ability to move beyond the starting state has a very low probability. However, with the addition of each relative or ancestor, the probability of adding more relatives increases. When the number reaches a certain point, i.e. when you have a sufficient base of ancestors and other relatives, the probability of adding one more individual approaches and eventually reaches 100%. At this point, the main limitation is the previously mentioned time/record decay curve. In my first installment of this updated series, I wrote a bit about FamilySearch.org and Ancestry.com. Actually, their business names are "FamilySearch, International, a Utah corporation" and "Ancestry.com LLC." Many business entities have what is called a "tradename" that is somewhat different than the name they use for their corporations or other business organizations. The type of business organization adopted by a company is very important to the owners and shareholders, but from the standpoint of the customers, it is largely irrelevant. Likewise, although of interest to the customers or users or whatever, the ownership of a large company is also largely irrelevant to its operation. The main point for genealogy companies is to understand who you are dealing with when you use their products and online services. It is also relatively common for a small segment of the genealogical community to view the operation of the larger genealogy companies in light of supposed conspiracies. Nothing in this regard could be further from the actual circumstances. Each of the companies has unique data collections and offers substantially different services. Of course, they all are involved in the overall topic of genealogical data and in some ways could be considered to be competitors, but they are only competitors in the sense that there is only so much money running around out there that people are willing to allocate to the genealogical marketplace. In fact, that marketplace is growing. These companies compete in the same way that different libraries in the same community compete. They do not compete is the same way as do similar food stores or department stores or other commercial businesses. The genealogy companies are not selling a product, per se, they are primarily selling a service. When I was practicing law in Arizona at a medium-sized law firm, we had other firms in the area, many smaller and a few quite a bit larger. Since I was providing a service, I never thought of my work as competing with someone else. Mind you, there was plenty of competition, especially in court, but our product, the services we provided, were personal and somewhat unique. We certainly advertised, just like everyone else, but I would guess that almost all my "customers" or clients came from word-of-mouth referrals rather than any advertisements we did or from my personal contacts. Let me ask a question. Have you ever seen an advertisement for FamilySearch on TV or elsewhere? I fully realize that Ancestry.com has almost saturation advertising, but what about MyHeritage.com or findmypast.com? When was the last time you saw an ad, other than an email from the company directly to you, from any of the other companies? Back to the library analogy. I get emails and promotional material from my local library (which I mostly ignore) but I do not put those "ads" in the same category as I do with other commercial advertisements I get in print, on billboards etc. Even though the online, commercial, subscription, genealogical services are "big business," they are really in a different category from the day-to-day retail business of the world selling everything from electronics to socks and shoes. The key difference is the fact that nearly everything the genealogy companies are "selling" is really in the category of information and service of that information. Don't forget, one of the largest of these companies, FamilySearch, makes all their information available for free to the ultimate user. Ask yourself this question; Why would anyone buy a subscription to Ancestry.com if they could get information for free from FamilySearch? The answer to that question is not as simple as it may first seem. Now, I go back to my earlier statement, each of these companies has unique data collections (with some overlap) and each offers substantially different services (also with some overlap). Even though I had a "free" subscription to FamilySearch, I was motivated to pay for a subscription to Ancestry.com. Now, of course, because of some agreements between these various companies, I have a "free" subscription to Ancestry.com and other websites courtesy of FamilySearch. Does the fact that some users of one of the programs get access to the other programs for "free" change the way these programs work? No, but it is a basic indication that they do no compete in the same way that other commercial enterprises compete. For years, I belonged to two botanical gardens in the Phoenix area. My wife and family visited both regularly throughout the year. When I moved to Utah, we soon became members of another commercially operated garden in Utah Valley. We are willing to pay a significant annual fee, just so that we can visit the garden when we want to and as many times as we want to. Were the two gardens in the Phoenix area in competition? Even the question does not make sense. They were different. Both had cactus and other plants, but if I wanted to see and enjoy both, I had to be a member of both. This is not a matter of competition or even of an either-or situation. I liked both and chose to pay a subscription to both. This is more like the situation with the various genealogy companies. If I see a value in subscribing to the companies, then I will do so. If not, I don't. But I am not making that choice based on competing claims or products. My choice is based almost completely on my own needs and preferences. Membership in the local botanical gardens also gave me "free" access to a whole lot other gardens around the country. Did I visit these gardens and take advantage of my "free" membership? Actually, not at all and the reasons, again, are complex. So why the interest in who owns the genealogy companies? One of the basic motivations, years ago, when I wrote about this subject was the common question I got as to whether or not Ancestry.com owned FamilySearch or FamilySearch owned Ancestry.com. Guess what? I still get the same questions. I am also continually amazed at the lack of understanding as to what all of these companies are and what they do. 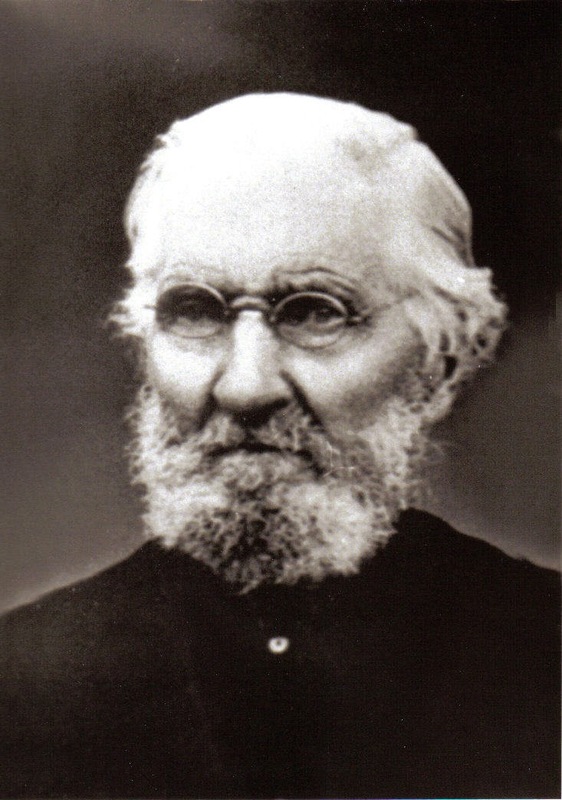 There are a substantial number of members of The Church of Jesus Christ of Latter-day Saints, the owner and operator of FamilySearch, International, that have no idea what FamilySearch is or what it does. When I am asked a question, I usually start to think and write about the answer. Yes, this series will go on and talk about the other companies. By the way, the BYU Family History Library just uploaded a video of my presentation about a comparison of the five big companies. The first part of the video addresses the free access issue only of interest to LDS members, but the rest is interesting about the content of the online databases. You might want to read the previous part of this series. 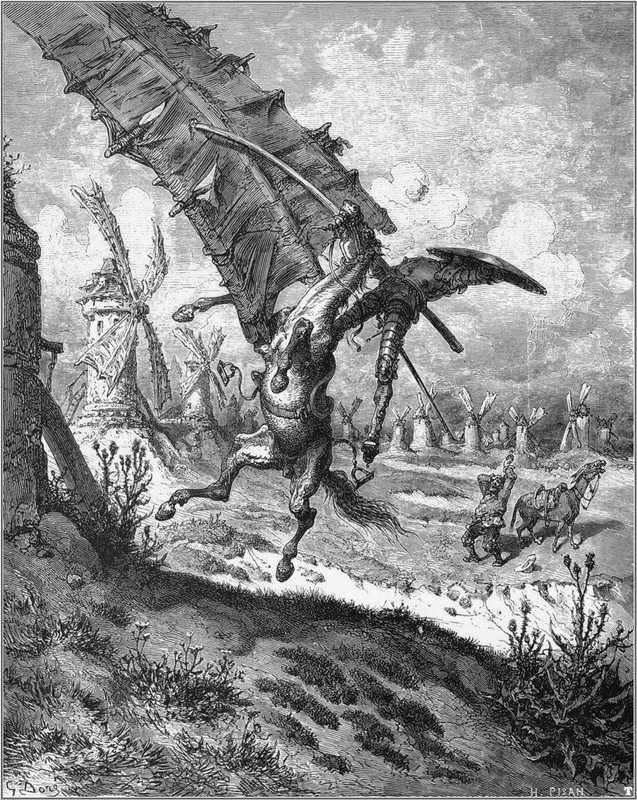 Don Quixote fighting a windmill on his horse, Rocinante. In the background Sancho Panza next to his donkey. When I was much younger, we used to play a variety of outside games including capture the flag, kick the can, run sheep run, red rover and many others. We also spent a lot of time playing inside board games. I think our favorite was Monopoly, but I recall many others. As I think back, I realize that none of us really knew the rules of most of these games, assuming there were some official rules. In fact, even though Monopoly had printed rules, we usually played by our own rules. There were always exceptions to the printed rules that we agreed on in advance or even during the game itself. There was huge contrast between these spontaneous, loosely organized games and what has come to be called "organized sports." When my own children began to play games, such as baseball, they were regimented into a situation where you had to play by the "rules." If there were ever any doubt about what the rules were, there was always someone there with an "official rule book" to resolve any disputes. The main difference was the involvement of the parents (adults) in "supervising" the play. From my own perspective, it seemed that the organized sports were run primarily for reasons known only to the parents sitting on the sidelines. Especially in the beginning with T-ball for the newest Little Leaguers, most of the children playing on the field only had the vaguest idea of what baseball was all about. I can seriously say that I had a lot more fun and enjoyment from playing capture the flag than I ever did participating in organized sports. Going up against the bastions of organized sports, especially on the college/university or even at the professional level is like poor Don Quixote tilting at windmills. So who calls the rules for the genealogical community? Who wrote the book and when did I agree to play by the rules of the game? What is meant by "unrighteous dominion?" In my terms, it means that those who perceive themselves to be in "authority' start to play the game by their own rules. They want to be the "king of the hill." Don't misunderstand what I am saying. I am not an anarchist. I do not espouse chaos. What I am saying is that genealogy is no different that any other organized activity, there will always be those who believe that they are the ones who are entitled to call the rules. I think to some extent, I am still back there playing capture the flag. I know there are rules out there somewhere, but the game is a lot more fun if the rules aren't too restrictive and you can make up some of them as you go along. I am afraid that too many of those who are initially attracted to investigating their family history, get introduced to the rules so quickly that they lose interest. The game just isn't any fun if you don't know how to play by the rules, especially when it seems that everyone you talk to has a different set of those rules. So far, in my thirty plus years of genealogy, I have yet to see the rule book. Maybe there isn't one? It has been a couple of years since I went through the process of analyzing who owns the various online genealogy companies. Since my last posts on this issue, there have been several notable acquisitions. The larger companies continue to expand. The notable exception, of course, is FamilySearch, International, which is a wholly-owned subsidiary corporation of The Church of Jesus Christ of Latter-day Saints. FamilySearch International is listed as first registered in 1999 and is doing business as FamilySearch and the Genealogical Society of Utah. In fact, FamilySearch was formerly known as the Genealogical Society of Utah and the name "FamilySearch" was first used by that organization that began in 1894. The organization and the acquisitions of the other large companies are much more complex and more difficult to reconstruct. Some of the acquisitions over the years have not been well publicized. Current ownership is usually a larger corporation or an investment group. Some of the acquisitions have been substantially modified or even completely absorbed by the new parent corporation. The current genealogical scene is further complicated by the fact that some of the companies have partnerships or "strategic alliances" with other companies. FamilySearch has been particularly aggressive in seeking these partnerships, some of which have been well publicized. Since my last post on this subject, these partnerships have become a major factor in the expansion of all of the larger companies and many more of the smaller companies. With the larger companies, the partnerships involve a trade of genealogical record accessibility for technological assistance primarily through providing indexing services. In the past, response to my posts has included a measure of paranoia from certain commentators. It is usually evident from the content of the comments that the individuals involved in making these comments about possible conspiracies are entirely ignorant of genealogy as an activity and are merely making their comments based their impressions of large corporations in general or, in some instances, prejudice against the owners of the companies or some-sort-of imagined agenda. Another area of concern by commentators has been the issue of the ownership of genealogical records per se. There is a certain segment of the online community that believes that any information, no matter how acquired or designated, should be entirely free and so a certain amount of ire is directed at the large companies simply because they exist. This attitude also shows a marked degree of ignorance of the way records are created and maintained. Record repositories have very substantial overhead expenses and the cost of maintaining, cataloging, indexing and providing access to billions of records is enormous. These costs have to be covered by subscription or donation. These commentators also wrongly discount the cost an individual would have to pay to acquire access to these records before they were made available online. That said, here is the current list. As usual, if there are any omissions, I would be more than happy for constructive comments. I may as well start with the most popular and what is claimed to be the largest online supplier of genealogically related records. Quoting from the Ancestry.com website, "About Ancestry,"
Our revenues have increased from $225 million in 2009 to $620 million in 2014. The company is majority owned by Permira funds, along with certain minority co-investors. Permira is an international private equity firm. Since 1985, the funds have made over 200 private equity investments with a focus on driving transformation to build better businesses. 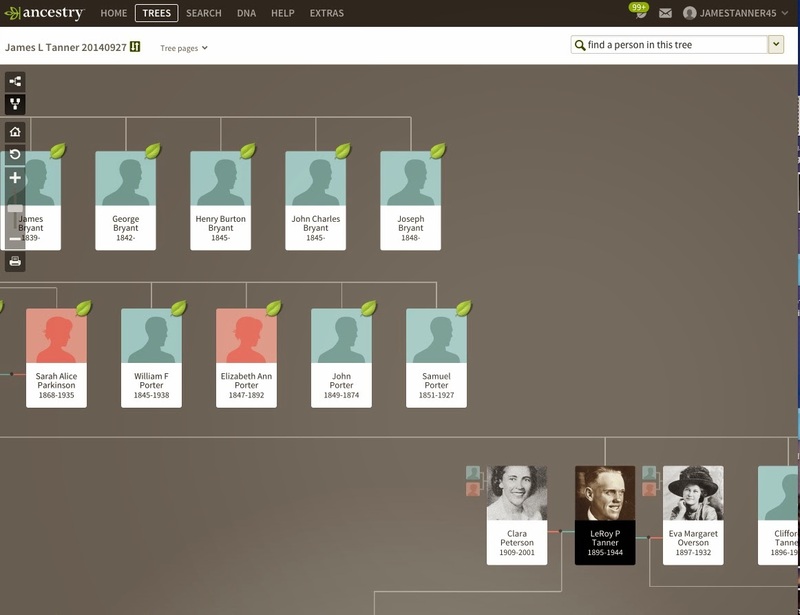 Permira has a rather long list of investments and Ancestry.com is one of the largest. Most of the companies are unfamiliar to me and are outside of the United States. Permira currently has fourteen offices, all of them outside of the U.S.
Ancestry.com has a long list of subsidiary websites that it has established or acquired. Here are the ones I have been able to find. The international websites are quoted from the Ancestry.com International list. Ancestry™Ancestry, launched in 1996, hosts the world's largest online collection of family history records - currently more than 14 billion, including the complete US Federal Censuses, US immigration records, military records from as far back as the Revolutionary War, and also many exciting collections from around the world. Ancestry.co.uk™Ancestry.co.uk, launched in 2002, hosts the UK's largest online collection of family history records with more than 1 billion searchable records including England, Wales and Scotland Censuses, exclusive online access to UK birth, marriage and death records, plus a comprehensive selection of WW1 military, immigration and parish records. Ancestry.ca™Ancestry.ca, launched in 2006, is the leading Canadian family history website with 235 million family history records including exclusive online access to the Censuses of Canada, the Inbound Passenger Lists and Ontario and British Columbia vital records. The site is in both English and French language. Ancestry.com.au™Ancestry.com.au, launched in 2006, is Australia's most popular family history website and home to more than 2 billion Australian and UK family history records which includes Australia's largest online index of birth, marriage and death records, the most comprehensive online collection of Convict and Free Settler records, the Australian Electoral Rolls, plus parish records, newspapers and much more. Ancestry.de™Ancestry.de, launched in 2006, is the first website to host a significant collection of German family history records - currently more than 185 million, including the Hamburg Passenger Lists, both the German Phone and City Directories, plus international censuses, military and parish records with German relevance. The site is in local language. Ancestry.it™Ancestry.it, launched in 2007, hosts more than 20 million Italian family history records including civil registration records of births, marriage banns, marriages and deaths assembled from provinces across Italy, plus international immigration and census records with Italian relevance. The site is in local language. Ancestry.fr™Ancestry.fr, launched in 2007, hosts more than 40 million French family history records including Paris vital records of births, deaths and marriages from as early as 1700s and other civil registration records from a variety of French provinces, plus international immigration and census records with French relevance. The site is in local language. Ancestry.se™Ancestry.se, launched in 2007, hosts more than 220 million Swedish family history records including immigration records from as far back as the early 19th century, Varmland church records from the 1600s, plus international censuses and vital records with Swedish relevance. The site is in local language. Ancestry.com has made several other purchases in the past of websites that are no longer online. In the next post in this series, I will take a look at some of the other websites. Take Time for a Geographic Timeline -- Part Three What's in a name? One of the basic rules of genealogical research is that of recording place names as they were at the time an event occurred in an ancestor's life. There are two implications of this policy: first, the use of the place name current at the time of the event, presupposes that the genealogist has done his or her homework and actually knows how the place was designated, and second, the further implication is that upon searching for records, the accurately recorded place name will assist the process of finding pertinent records. This rule is based upon the principle that records are most likely to be found associated with the various jurisdictions in effect at the time of the event. For example, military records are most likely to be maintained by the country where the ancestor lived during the time such records were recorded. Records pertaining to marriages, deaths and births (christenings) were most like kept by the church with which the ancestor was affiliated. The examples could go on for each type of record. From the time of the creation of the record, until the present time, the record could have migrated to another location. For example, a military record may have been created in an area of Europe that has changed hands several times since the date of the record's creation, thus causing the record to be moved as international boundaries changed. The same set of circumstances can happen on a much smaller scale in the United States as county boundaries change over time. Records created at the county level could have been moved as new counties were created from the old. This rule concerning the accurate recording of the place of an event at the time the event occurred also presupposes that the place where the record has ultimately been found will also be recorded as a citation when the record is used to support a genealogical conclusion. The main point here is that the places, as they are named today, bear little or no relationship to the location of the records about the ancestor. For example, a record about a Native American ancestor may have been created on the Rosebud Indian Reservation in South Dakota and is most likely presently maintained by the National Archives. If you were to find the records, you would ultimately learn that they are being maintained in the National Archives branch in Kansas City, Missouri. The purpose of the citation to a record is to provide a way for subsequent researchers to find the same records to verify the basis for the researcher's conclusions. Plymouth Colony, New England or the Plymouth Council for New England prior to 1685; today the records might be in the U.S. or the U.K.
You could also consider the following: from 1643 to 1686 the area was included in the Massachusetts Bay Colony and some sources include the area in the New England Confederation from 1643. Now this is what I have found so far. If you happen to have any corrections you are very welcome to make a comment and I will correct the list. It turns out to be far from simple to figure out which organization had jurisdiction at what time. You may well ask why we need to go through all of those iterations? What we are doing is keeping track of the places where documents (records or sources) might be found. Each of those jurisdictions are likely to have records that are stored or maintained or, at least, cataloged differently than the next jurisdiction in time. As you can see from the list above, this can be a difficult task. There is a lot more color and a little bit of redesign of the entries on the tree. The green leaf icons are quite a bit larger. Most of the other menu options in the Beta version don't seem operational as yet. So there is not a lot to say. As I get a more detailed look, I will report back on my impressions. Present-day research in genealogy is information intensive. Genealogists in years past had to confront the same amount of information, but comparatively little of it was immediately available. My two great-grandmothers, who spent much of their lives accumulating genealogically pertinent data over 30 and 40 years, would find all that they reviewed almost instantly available today. For example, reviewing the U.S. Census records for just one individual, before online digitized databases, would involve many days of research working through rolls and rolls of microfilm hunched over a microfilm viewer. My great-grandmothers even did much of their research before the advent of microfilm. Now I can go on one of the larger websites and find record hints for all of the census records for an individual almost instantly. I can review and attach all of the pertinent years in less than an hour. 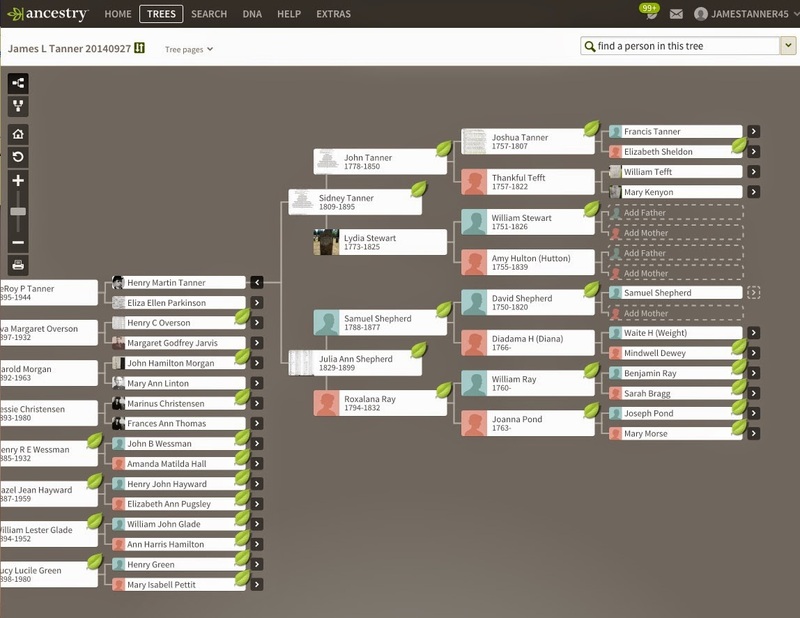 If I go on to my family trees on Ancestry.com, MyHeritage.com, findmypast.com and on to the FamilySearch.org Family Tree right now, I will see many more than 10,000 suggested sources which have been preselected for me from billions of potential records. These records are suggested with a high degree of accuracy from a monumental pile of records that would have taken me years to find before this technology was developed. My primary tools for writing this blog, doing genealogical research, and helping teach others about genealogy are the computers I use every day, all day long and into the night. On a day when I am accomplishing a lot of genealogically-related work, I might spend as much as 14 hours on or waiting for computers. From my perspective, even a small amount of speed increase, such as my current Google Fiber connection is worth the cost. With Google and their ads, Google Fiber is all about Internet and TV. With me, it is all about working faster and more efficiently. Over the years, I have progressed from the primitive computer technology to the highly complex and impressively fast technology we have today. When I started using a then-new Apple II computer in 1982 with Dan Bricklin and Bob Frankston's newly developed VisiCalc spreadsheet, my life was transformed. That is another and very long and involved story. At the time, I was just in the process of becoming a partner in a new Apple Computer retail store. Over the 11 years I was involved directly with the Apple company and many other manufacturers including Kaypro, Compaq, Osborne, IBM and many others, I was able to try every new computer as it was introduced. As I tried the new computers, I was always impressed by the increases in the speed of their data processing ability. It seemed that every new computer was a major step in speed and complexity. Each of the upgraded computers would seem to be so much faster than its predecessor and I had the incentive to get rid of my older model and get a newer computer. The new computer would seem fast for a while and then as I got faster in entering and processing what was on the screen, it seemed to slow down to a crawl. This happened over and over again as the developers increased the speed of the processors and the rest of the components. For example, one big increase in speed was the advent of hard disk drives. Gone were the days of waiting for slow floppy disks and swapping out multiple disks. Let's fast forward to today. A few years ago, I suddenly realized that computers had progressed to the point where they could handle all the data I could throw at them. My benchmark was how long it took me to open and manipulate complex graphic images with Adobe Photoshop. In addition, my concern was how long it took me to maintain a genealogical database containing tens of thousands of names with all of the accompanying documents and images. What I found was that the computers themselves were getting only incrementally faster and that the real limits were now imposed by my own speed of entry, ability to read and review what was on the screen and other factors. In fact, the overall limits were imposed by the speed of transmission of the data between the Internet and between the hard drives and other storage devices. Moving Gigabytes and soon Terabytes of data took more time than any other activity. At this point, I realized that faster computers would only have a marginal effect on my constant need for more speed. Now, a side note. I do not really think that even a vanishingly small percentage of my readers or any other genealogists are even partially obsessed with the speed of the whole system as I am. I move to voice recognition and other technologies whenever I am frustrated with the time I have to perform a task and the amount of time the task is taking or I switch from one computer to another and even have two or three devices going at the same time. All of this to do more work in less time. I am sure some consider me to have a serious problem, but I am fighting against nature imposed time limits. I am getting older day by day. On the horizon, I see Apple and Microsoft both discussing adding new computer operating systems and Intel introducing new processing chips. But I do not see the obvious increases in speed that I saw with the early personal computers. It is taking longer and longer for the computers to "slow down" in my perception. In fact, my present computer, an iMac with a 2.66 GHz Intel Core i5 processor running OS X Yosemite, Version 10.10.2 seems just as fast as iMacs selling today. The newest iMacs are running fourth generation Intel Core i5 processors with Haswell architecture and clock speeds up to 3.4 GHz. But using that additional power is limited by the programs and the Internet's transmission speed. When will I jump on the bandwagon and move to a newer computer? That now depends on factors completely outside of my need for speed. The main factor is the cost to upgrade all my peripheral equipment and software when I move to a new computer. The real decision making point depends on how long my present computer continues to function. Because of the massive amounts of data I have and my daily routine, I cannot afford to have my computer go down. When I feel that the system has served its purpose. I will immediately buy the next available, most advanced computer I can afford. My best estimate is that this will occur when the next round of operating system changes come out. I have already seen that an upgrade of the iOS operating system for the iPads will not load on my current iPad, so the handwriting is on the wall. New computers are on the agenda. I have a very old blog post that dates back to 2009 that still gets a comment now and again. I have posted a notice on the blog that states that the post is woefully out of date and that the readers need to read more current posts. Here is a comment I received just today from my old friend Anonymous. I have done nothing to this comment except delete the name of the website, which I feel is irrelevant to my response and the amount paid by the commentator. I have also deleted the comment from the old post where it was made. Obviously, since this commentator decided to post his or her comment anonymously, there is no way I can either verify or refute the charges made. In reading this comment carefully, I note that the commentator claims to have "deleted my a/c 2wks before it ended. yet they stole my pension." I am not sure what is meant by this statement, but in almost every case, deleting the account probably did not give notice to the website that the person wished to terminate the free trial and not convert to a paid account. In every case, if you wish to end a free trial, you should follow the instructions on how to do this as set forth online on the website. I have examined the Terms and Conditions of each of the major online websites and they all have procedures for terminating subscriptions. For example, the Terms and Conditions concerning Ancestry.com subscriptions are accessed from a link on each page of the website and they are very clear about how to terminate a subscription. What is most puzzling to me is the reference to terminating the "free trial" "2wks before it ended." I am not familiar with any of the major websites that have time limit free trials that last more than 2 weeks. This person would have had to deleted the account before the "free trial" started, much less ended. I have been unsuccessful in finding a free trial period of more than 14 days. I am again puzzled by the reference to the attempts to contact the website by email. Almost all the larger websites have telephone support. There is also a reference to "various email addresses" which causes me to think. All of the larger websites have extensive help centers and contact to the companies is done directly through an email link online. I am not aware how anyone gets "many email" addresses for the larger companies. Some of my readers are probably thinking, why am I cross-examining this poor person who lost their "pension" funds for heating and food to the nasty online program? My question is why is this person so upset when they are one who signed up for a program with no intention or ability to subscribe. Any offer of a "free" anything is nothing more or less than an inducement to sign up for the entire program. Why would this person be in "tears and shock" when he or she was the person who subscribed. In examining the termination procedures for various programs, I find that the way to cancel a subscription is rather easy in almost all cases. Next we are to believe that this person's bank will not investigate the problem for a week. Further, the charge would have been against a credit card, not cash out of an account. The comment fails to explain how the money came directly out of the bank account. I am reasonably familiar with the procedures for contesting a credit card charge and I know from my own experience that it does not take a week to get an answer from a bank. Obviously, this comment was made in an attempt to be disturbing, but after reading the comment several times, I am reasonably sure that the whole thing is a hoax and an attempt to slander a company. The main reason why I feel this is the case is the very fact that the comment appears on a blog post that is six or more years old and where the person posting the comment has apparently ignored the notice of that fact. Why the long analysis and commentary? This is a comment aimed at a genealogy company. I have no idea of the motivation for the comment, but we, as a community, are not immune from this type of appeal. It is difficult to imagine the real agenda here, but this type of complaint has no place in our community. Finally, if this person had not signed in anonymously, I could possibly have helped them resolve their situation. Making this type of complaint and then acting from behind a screen is just not a good idea. Material which is comprised in public records within the meaning of the M3 Public Records Act 1958, the M4 Public Records (Scotland) Act 1937 or the M5 Public Records Act (Northern Ireland) 1923 [F111, or in Welsh public records (as defined in the[F112 the Government of Wales Act 2006]),] which are open to public inspection in pursuance of that Act, may be copied, and a copy may be supplied to any person, by or with the authority of any officer appointed under that Act, without infringement of copyright. There is usually a charge for obtaining copies of the records. See "Looking for records of a birth, marriage or death in England and Wales" from The National Archives. Why does the Crown own all these documents? Is there a difference between the act of maintaining and providing the records and owning the records? What do we mean by "ownership?" I am convinced that there is a fundamental difference between the statutorily created right we call "copyright" and the concept of ownership. Another example comes from my interaction with the various special collections libraries around the country. I recently agreed to look at some public documents from the State of Utah for someone out of state. I approached a special collections library that had the records and was told that I could get access but that I could not copy the records and there was a charge for copying at 25 cents a copy. I needed several hundred pages and so I was not overly happy with the charge. I asked if I could copy the records with my camera and was told that they could not allow me to do that. These were so-called public records from a county in Utah. Did the library own those records? Why did they have any interest in those public records that would allow them to charge for copies and refuse me the opportunity to save the money and make photographic copies myself? How did the library obtain ownership of the records? These documents dated from the mid-1800s. After pressing the issue, I was finally given permission to make my own photographic copies, but in order to do so, I had to put a notice, supplied by the library on a clear plastic strip, on each of the photos, limiting the republication of the copies. There is no question that these particular documents are old enough that there are no copyright claims. Why then is there any vestige of ownership in these old 19th Century documents? Granted, the library has the cost and overhead of maintaining and archiving the documents and granted they may have some basis for arguing that they need to charge for the copies, but what else? I was told that they were limiting my ability to make the copies out a concern that the documents would become damaged. How does that apply to my taking photos? Why insist that I put their claim notice on every photo? Why would they care whether I used or did not use the copies of these documents? Again, how did they obtain an ownership right in the old documents? These are only two examples of many I could recount. The issue here is a question of ownership and control. In the case of the library, I was also told that "FamilySearch" had come and digitized the documents. Unfortunately, I do not find that these particular records have ever made their way online. I am not in the camp of those who think all information should be free. I think they are confused with the concept of free speech as defined by the U.S. Constitution and subsequent court cases and the reality of writing, conserving, producing, storing and archiving that same information. Someone has to pay to keep the libraries open but does that mean that the libraries own the material they store? There needs to be a clear distinction between charging for the cost of maintaining the documents and limiting acquisition to the content of the documents under some guise of ownership or control. As I said above, this has nothing to do with the concept of copyright. There is something else going on here. Many genealogical researchers seem to lose track of the time element in their accumulation of names and dates. Commonly, I see the location of events before 1776 are said to have occurred in the United States of America, an historical impossibility. However, there are a number of researchers that feel that the place of an event should be recorded in its presently designated location. To the contrary, the best practice is to record the location of all events as the locations were designated at the time the events occurred. Since many types of records are created in jurisdictions with geographic proximity to the events recorded, it important to recognize the jurisdictions responsible for those records. If they ignore this rule, researchers may find themselves looking for records in places where they do not exist. Additionally, tracing records to the present storage location is much easier if the researchers knows the political and social boundaries in place at the time of the event. One of the more common errors committed by inexperienced researchers is believing the references to places of birth of parents listed in the U.S. Census records. One example of this was a patron at the Mesa FamilySearch Library who was looking for his ancestor in "Austria" and found that the person spoke "Hungarian" and therefore was not an Austrian at all. The search in Austria was initiated by the reference in a U.S. Census record. It is imperative that genealogical researchers become aware of not only the local but also the national history of the area in which they are conducting research. International boundaries change frequently. There is no substitute for examining maps made close to the time that events in the life of the ancestor occurred. 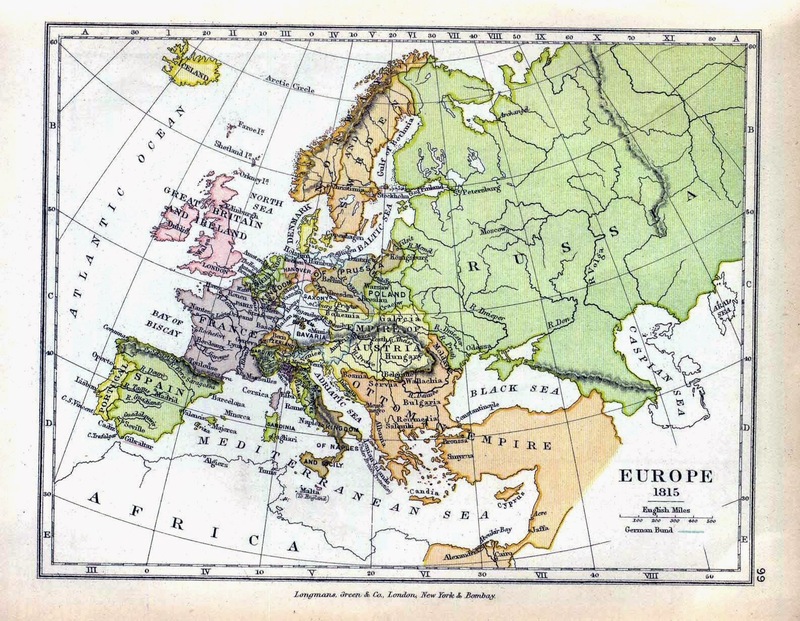 There are fortunately huge collections of historical maps online. One of the most helpful websites is OldMapsOnline.org. This website provides links to hundreds of thousands of online maps in different areas of the world. The interface is extremely useful in that it lets you draw a rectangle around that portion of the world you wish to search for maps. The website then selects out all the maps that fall within the rectangle. A significant challenge in determining the place of origin of an immigrant is determining the name of the place at the time the immigrant was born. In some parts of Eastern Europe it is possible that the same location has a name in more than one language. Some places in what is now Poland have place names in both Russian and German. It is important to search online for information concerning the previous name of various locations to attempt to ascertain what the place was called at the time. This is particularly true for places such as Poland that have undergone considerable political change. Once you begin the task of searching for a place, you will find that the task can seem to be overwhelmingly difficult due to the staggeringly large number of geographic resources online. The number of maps alone is overwhelming. However, this wealth of information indicates that there is really no excuse for being vague about a place as long as the research indicates a way to identify it properly. One of the sad commentaries on the research efforts of many in our genealogical community is a complete lack of awareness of the historical context of times when their ancestors were living. The serious side effect of this lack of awareness is the fact they have no idea where to look for their ancestors when family tradition or the U.S. Census says that the family they are searching for came from "Germany" or even "Kentucky." I have been suggesting for years that every location for every individual be verified. Cities, counties, states and countries change over time. OK, the list is very interesting. If you want an advanced look at your historical boundaries, you can download the KMZ File and open it in Google Earth. More about this later. One of the common questions to ask any city-county-state designation you find reference to in someone's genealogy is whether or not the places existed at all and further whether they existed at the time referred to by the reference. People have a tendency to generalize geographic locations. I might be from a small town outside of a big city, but for convenience, I say I am from the big city. Historically, this can mislead a researcher because the actual location of the ancestral home is obscured. Another problem is the habit people have to refer to a general area of the country rather than a specific location. Many of our ancestors recorded their birthplace as "Ohio" or "Kentucky" long before these places became specific states. Early reference to births in Kentucky, for example before 1792, occurred when it was a county of Virginia. Lack of historical awareness can cause a domino effect of problems in locating the right ancestral line. 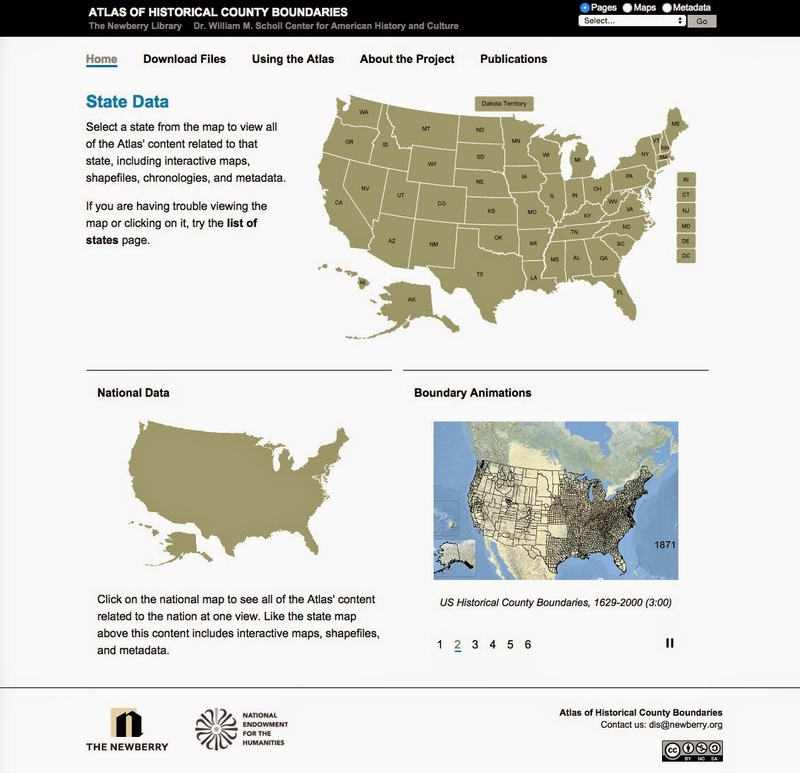 Your homework assignment for this first installment of the series is to explore the resources in the Newberry Atlas of Historical County Boundaries. This assignment includes selecting random place locations from your pedigree and verifying that the county designations are "correct" in the sense that the counties existed at the time of supposed ancestral event. Lack of accuracy in this regard will result in choosing the wrong ancestral line when someone with a similar name is chosen rather than the correct ancestor because of the geographic mistake. I can assure you, you will find errors. A recent blog post by Paul G. Nauta for FamilySearch is entitled, "RootsTech 2015 Breaks Records and Keeps Giving." Since I was personally involved in this year's RootsTech experience as both a presenter and as a blogger, and since I have attended all of the past RootsTech conferences, I have an interesting perspective on this year's (2015) events. I have also been involved in a number of "Family Discovery Day" activities already since attending the Conference. A short time ago, I taught four classes as a local event and I am already scheduled to teach a more of these Family Discovery Day events in the future. I am finding that the attendees of the RootsTech 2015 Conference have come away with an extremely positive attitude towards the Conference and with a greater interest in becoming involved in family history. In past years, there were always some negative comments, but so far, I have not heard any about the most recent event. From my personal viewpoint, the Conference was a tremendous success and I am most certainly looking forward to attending the next Conference in 2016. The 2015 Conference was certainly much better organized that previous conferences. I think the fact that the Family Discovery Day registration was limited is a clear indication of the interest and need for this type of major event. I fully realize how difficult it is to anticipate attendance, but with the caliber and participation of the Keynote presenters, a huge attendance could have been anticipated. I just hope that the people who came to see the famous people chosen to present at the general meetings, stayed long enough to learn something about genealogy. For my part, I was pleasantly surprised at the quality and relevance of the main presentations. I really appreciated, for example, getting to know Donny Osmond not just as a performer, but also as a family historian. I hope they do not run out of people of that caliber who have the family history connection to present in the future. One of the consequences of the growth of the Conference is the inevitable depersonalization of that many people participating in a conference. FamilySearch was helpful and considerate as usual, but I have to contrast the attention the bloggers got at the early conferences to that of the one this year in 2015. There were apparently 50 bloggers invited to participate. I certainly understand the role of a blogger, but perhaps there should be some more requirements imposed on future participants to write about the event and participate in other ways during the event? I would also suggest that given the effort to attract new people or less experienced family historians to the event, that more basic, entry-level opportunities be provided. If you look at the numbers quoted by Paul Nauta in his blog post, you will see that the Conference has reached the point of becoming a major event. Although attendance is not nearly as large as other popular conferences, for genealogy this is really big. Perhaps one way to keep growing is to create mini-conferences within the main event. For example, we already have an Innovators Summit for programmers, developers etc., why not have other interest groups such as bloggers, instructors, academics, etc. have a time or place to gather. I realize that as bloggers we had the Media Hub, but how about events or meetings or classes aimed at specific groups within the greater genealogical community? As far as the Family Discovery Days, these are the best idea yet. I am seeing a lot of people who had no real interest in attending a conference in Salt Lake, now having the opportunity to share in some of the excitement and benefit from the overall conference experience. All in all, I thing RootsTech is one of the best things has happened to genealogy in the United States (even if they do insist on referring to it as family history). 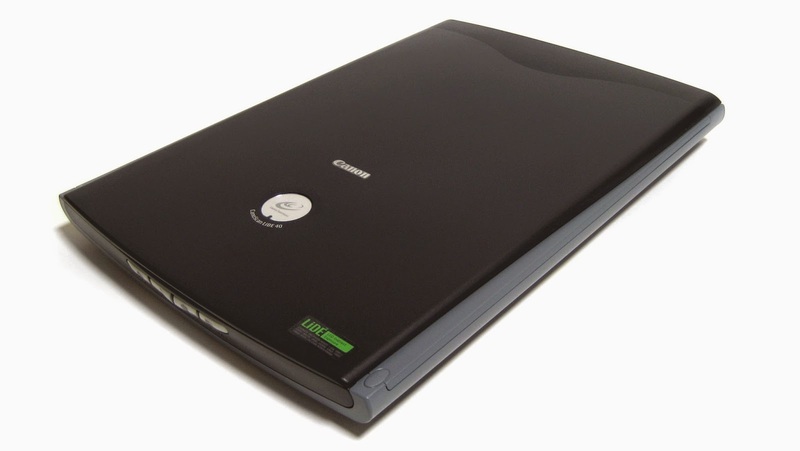 The term "scanner" covers a huge assortment of electronic devices for digitizing all sorts of original documents. In fact, the term has now been extended to 3D scanners that digitize three dimensional objects for 3D printers or additive manufacturing. Wikipedia has ten different types of devices listed on its disambiguation page for the term "scanner." Some of the devices, known as book scanners, actually incorporate high resolution cameras into the scanning process. The devices using the label "scanner" can cost under $100 or cost many tens of thousands of dollars. As a genealogist, unless you intend to get into the commercial business of making scanned images as a service, you will probably settle for one of the many models of "flatbed" scanners such as the one illustrated above. This type of device is sometimes called an "image scanner" to differentiate it from other types of scanners. A flatbed scanner has a flat glass plate, similar to a copy machine, and the same type of copy machine light source. Some of the flatbed scanners today use a charge-coupled device (CCD) or a contact image sensor (CIS) as the image sensor. The light source for flatbed scanners is usually a xenon, LED or cold cathode fluorescent type. An alternate type of scanner uses a contact image sensor (CIS) scanning consists of a moving set of red, green and blue LEDs strobed for illumination and a connected monochromatic photodiode array under a rod lens array for light collection. See Wikipedia: Image scanner. The main issue in using a flatbed scanner is the time it takes to make one digital copy of a document or photograph. It can become extremely tedious to raise and lower the lid and replace the documents or photos to be copied. The image quality is usually very good, depending on the software supplied by the manufacturer. Most of the flatbed scanners available today, scan in color, black and white an gray scale. The newer models have all moved well beyond the needs of high quality archival standard scanning. I will be talking a lot more about scanner resolution in future posts. How many documents do you expect to scan? How long will you spend scanning? Do you intend to use the scanner for purposes other than genealogy? Are you concerned about archive quality or do you want quick and dirty? As you think through the physical process of scanning, you must also consider what you are going to do with the computer files created by the scanner. I will also be posting more information about understanding and using the different file formats. It does no good to purchase a scanner and then fail to learn how to transfer the files and use them as media attached to your genealogical database whether online or on your own computer. 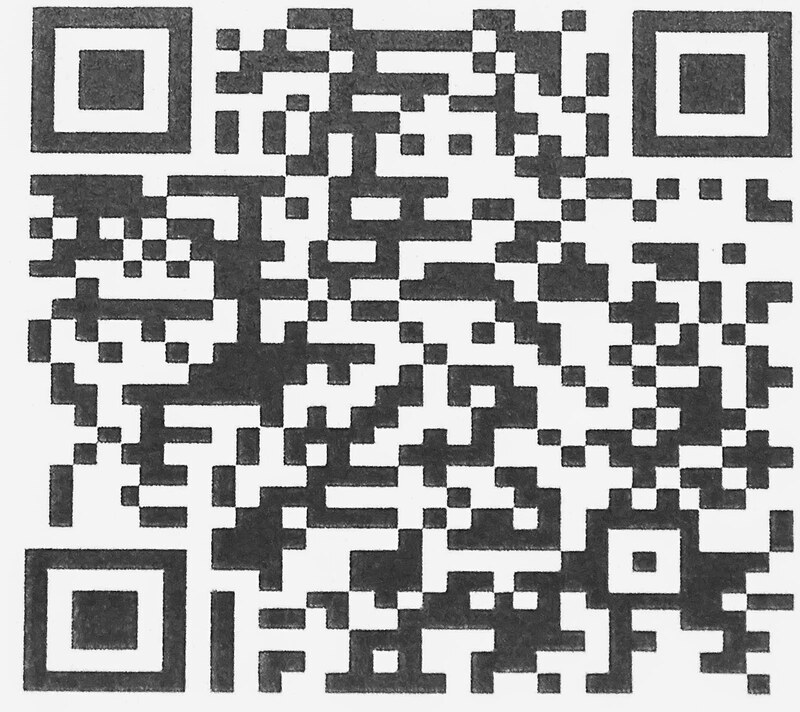 Depending on the amount of paper you need to scan and the time you have to spend doing the scanning, you may wish to look into the possibility of purchasing a sheet-fed scanner. This is also a topic for another post. As you can probably tell, scanning documents for use in a genealogical context can be a somewhat technical area. I only have to go online and look at the quality of the images uploaded to family tree websites to know that many researchers lack a basic understanding of the way to scan an image or how to handle the digitized image file. Of course, the scanned image can be no better than the original, but sometimes there is a high quality scanned image already available of the ancestor and someone has uploaded a very, very poor quality copy of exactly the same image. There are a lot of considerations in making images for genealogical purposes besides those involved in the technology of the various scanning devices. Here are two images of exactly the same photograph from the FamilySearch Memories section. Both images are copies from an original photograph. A high quality scan of the original is available on the same page as these two photos. This is apparently the photo from which the two copies were made. There are a lot more considerations about image quality and choice than just the technology involved in making scanned images.